Late summer ocean fun: The last week of August, we took an RV trip to the southern Oregon Coast, stopping for several days in Bandon and again in Newport. The weather was mostly sunny and clear, and the beaches offered exploration of sand, surf, numerous sea stacks and rocks, tidepools, and lots of sea animals. One of Sofia's favorite activities was watching (and even helping) the crabbers along Bandon's crabbing dock. We also enjoyed the Oregon Coast Aquarium in Newport, as well as the Newport waterfront, especially its noisy raft of sea lions. Heading east for sun: We were so disgusted with Seattle's cool and dreary summer weather that we decided to get away to guaranteed sun. So we spent a weekend in Moses Lake, Washington. We stayed at a Best Western on the lake with an outdoor pool, and Sofia spent all Friday afternoon and Sunday morning playing with other kids in the pool and laying in the sun. Saturday we spent all day at the Surf 'n Slide water park. It was a great choice for a family looking for sun and water play, with water slides, diving boards, a 300-foot Lazy River, a children's beach, and a surfing simulator. Sofia tried body boarding three times and was very proud of herself when she stayed on until the lifeguard had to ask her to stop! Next, the Tour de France: Sofia shed her training wheels and has learned to ride a two-wheeler! 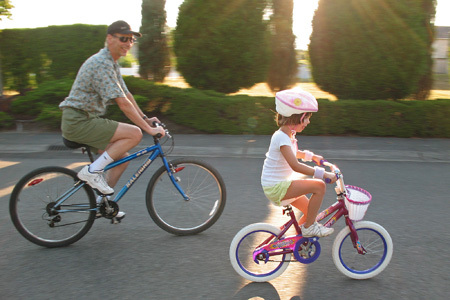 With help from our friend Rob, she learned in about six practice sessions, and now she comes home from summer camp and begs to go on a ride around the neighborhood with Mom or Papa. Another year older: Jan celebrated a birthday (he's no longer telling which one) July 21st. He spent most of the day on the phone, as family called from the Netherlands and elsewhere. After delicious lemon cake (thanks, Trudy), ice cream and gifts, Jan and Amy went to a Left Foot Boogie Summer Dance Party in Bothell. The live band even played a special birthday dance to honor his day! Finally some sun! : While Cameron began (temporary) work at an engineering firm, Jan, Sofia, and Amy flew to San Diego to enjoy some sun and warmth after a record-breaking stretch of lower-than-75-degree temperatures in Seattle (eventually lasting from September 23, 2009, to June 23, 2010!). Sofia enjoyed the motel swimming pool nearly every day, and we had a wonderful time visiting SeaWorld, the San Diego Zoo, and the San Diego Wildlife Park, as well as the beaches of Del Mar and La Jolla and the lighthouse at Point Loma.